New Orleans has some great history of men with their trials and tribulations, but women have always influenced this incredible city equally! Consider the difficulties of living in a swamp in the early 1700’s and building a life for your family or yourself along the years so that this amazing city would later become one of the most visited in the world for its rich history and architecture, literature and allure. 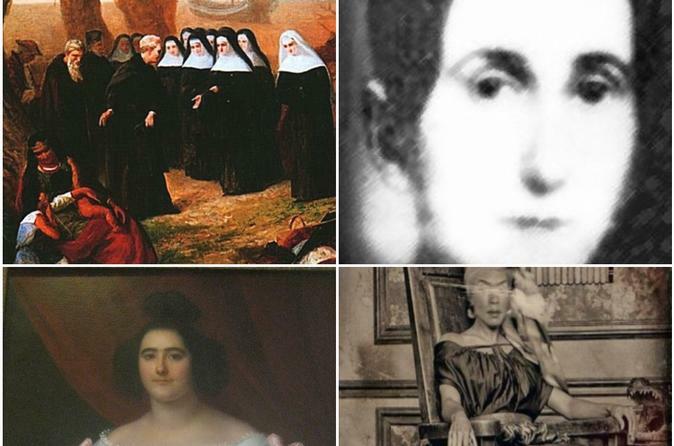 Some of the most influential women have included the indigenous people, the NATIVE AMERICAN WOMEN, the URSULINES NUNS form France, The aristocrat BARONESS MICAELA ALMONESTER PONTALBA, The first African American nuns, THE SISTERS OF THE HOLY FAMILY, Voodoo Queen, MARIE LAVEAU, The womens literary group, LE PETIT SALON, the “LADIES" OF STORYVILLE at the red-light district, MADAME DELPHINE LA LAURIE, the QUADROON BALLS, authors, and women of culture. Come hear about it through the eyes of a local and Licensed Professional guide! We will beging our WOMEN OF NEW ORLEANS TOUR in front of the famous St. Louis Cathedral in Jackson Square where we will first talk about the WOMEN in the CENTER of TOWN such as the BARONESS MICAELA PONTALBA, the URSULINES NUNS and of course the WOMEN of the LITERARY ARTS at LE PETIT SALON, authors and more. We will stroll casually through the French Quarter and talk about the QUADROON BALLS, where hopeful women would be selected by a rich Creole man and be taken away from poverty, changing hers and her childrens lives forever. The women were known as PLACAGE or contracted mistresses. Women of New Orleans will be discussed such as the VOODOO QUEEN, MARIE LAVEAU who helped people with yellow fever through alternative medicine and prayer. ELLA BRENNAN, the great restauranteur, who created the huge Brennans Restaurant empire will be part of this tour. An incredible fete was won by HENRIETTE DELILLE ,who created the SISTERS OF THE HOLY FAMILY, known as the first African American Nuns. Along the route we will speak of the WOMEN of STORYVILLE, not necessarily the most socially accepted "ladies" but nevertheless influential in many ways at the red-light district. A woman by the name of MADAME DELPHINE LA LUARIE, the infamous aristocratic Creole woman was known as a slave torturer, many stories repeat regulary of her horrid reputation. Come enjoy an evening with a local and Licensed Professional Guide as we take you on a journey into our history and incredible past here in the Big Easy!